London Underground is pressing ahead with plans to have mobile phone transmitters in the Tube, after allaying safety fears. Lib Dems on the London Assembly had opposed the plans, outlined last year, because of fears it might provide a new method of detonating bombs. But they have been persuaded that any extra risk is minimal and that in an emergency, people need their phones. A study looking at putting transmitters in four stations begins this month. The two-month feasibility study will look at the space, power and changes needed to put mobile phone masts in stations. It could mean the internet, digital radio and TV could eventually be broadcast in stations and wireless internet "hot spots" could be set up. 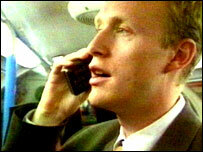 But it is likely to be the summer of 2008 before commuters can phone people from underground. The contract will go out to tender in 2007. The project was first unveiled last year, before the 7 July bombings on three Tube trains and a bus. It raised some concerns that putting transmitters on the Tube could mean bombs being detonated by phone. But while the March 2004 Madrid train bombs, which killed nearly 200 people, used mobile phones, they were detonated by the phones' timer functions, not a signal. An LU spokesman said: "The timer of a mobile phone operates independently to whether it is in a location that can receive a signal or not. "Therefore, the Tube would not be placed at any greater risk from that type of attack than it is now." Lib Dem London spokeswoman Lynne Featherstone said safety talks between LU and the phone networks had provided some reassurance. "Better communications could be of enormous benefit in the event of an emergency, allowing passengers to communicate with the emergency services and worried relatives," she said. The scheme could bring in millions of pounds for the Tube from mobile phone operators.